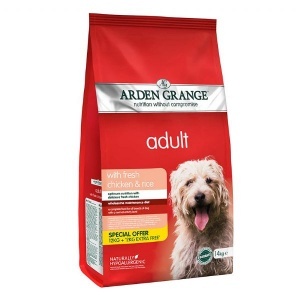 Arden Grange Chicken and Rice dog food contains a high proportion of chicken (32%) - providing the top quality protein that is essential for the structural and functional demands of the adult canine body. Human grade chicken - no battery farming and no growth hormones or antibiotics. Medium sized kibble suitable for most breeds of adult dog. 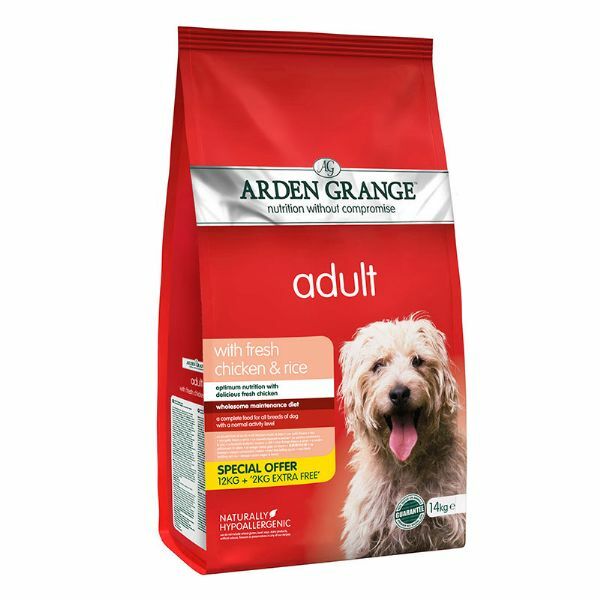 Arden Grange dog food has chicken oil as the primary fat source which is easily digested and the most appropriate for the largely carnivorous needs of dogs. Super-premium ingredients including chicken meat meal are superior quality and include no feet, feathers, heads or undesirable material. Feeding Arden Grange dog food reduces the risk of dietary intolerances and allergies that can cause digestive disorders and skin complaints. Chicken; (chicken meat meal 27%; fresh chicken 5%); rice 26%; maize; refined chicken oil; beet pulp; chicken digest; whole dried egg; krill; yeast; whole linseed; minerals; prebiotic FOS; prebiotic MOS; yucca extract; glucosamine; MSM ; chondroitin; cranberries; nucleotides.